The new Posi-Bend rotary-bender line from Dayton Lamina, Dayton, OH, is designed to be less complex and less costly than wipe tooling, according to company officials. Rotary bending provides consistent metal forming without wasting material on tests and regrinds. The self-contained rotary bender cams the material without undesired distortion, sliding or marring. Other advantages noted by Dayton Lamina include the ability to bend greater than 90 deg. 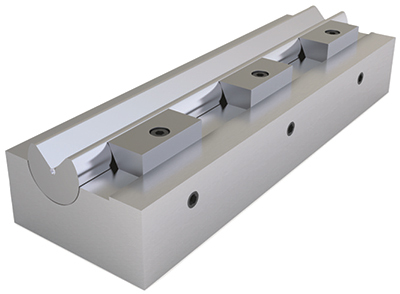 and to bend ultra-high-strength steel, elimination of cam tooling for producing overbends and lower tonnage than required for traditional wipe tooling. Standard sizes are in stock for same-day delivery, and custom orders are available with short lead times.